The Northern classic is a double elimination wrestling tournament that Fairfax HS has been hosting for the past 23 years. It's a tournament that draws in 32 Northern Region public and private schools in the Washington metro area. 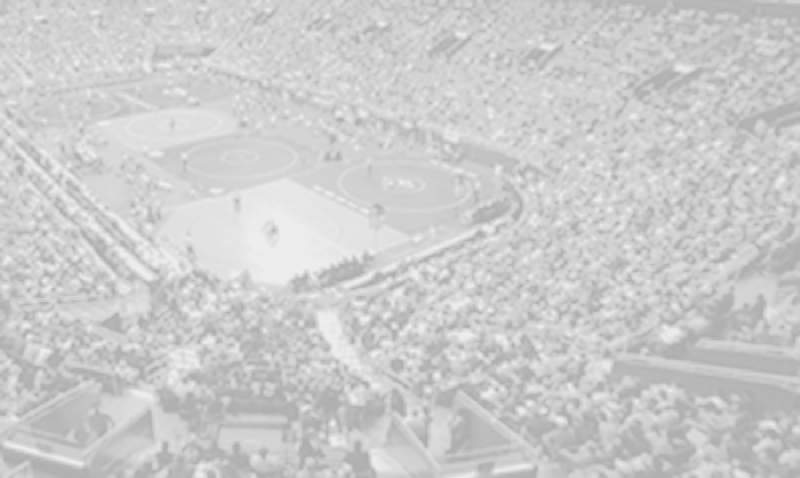 This classic is set-up with a 32 man bracket in each weight class that hands out medals to the top 8 wrestlers in each weight class. Simply to win the NOVA Classic one must win 5 matches in a row which should prove that you are considered to be one of the best in Northern Virginia. After finishing second to Westfield High School last year at the NOVA classic, Fauquier once again was in the hunt and the team had a desire to take home the first place trophy right from the first match on Friday. With three individual champions and earning 226 points, that’s exactly what the Falcons did. Nothing fancy about this team’s achievement as the Falcons continue to step on the wrestling mat and pin their foes. To win a tournament like the NOVA classic it takes a whole team effort. To advance 5 wrestlers to the finals and having 9 total wrestlers that placed must tell one that Fauquier currently is a team that is very competitive and once again proving it around the state by being on top of the field. Below is a short description of how each round went during this two day event. Round one: Right from the first match of the tournament the Falcons set the tone as they started and finished with wins in every weight class; earning seven pins, one tech fall, and two byes through this first round. Even with fewer participants (Fauquier did not fill a 152, 170, 195, and 220 weight class) at this meet they still found themselves in the mix and in 2nd place with 31.5 points right behind Annandale HS. with 35 points. Round two: Not letting off the pedal whatsoever, the Falcons wrestling team continued their dominance through round two by going 9-1 as a team and earning 9 pins. That alone had Fauquier on top of the leader board jumping over Annandale with 71.5 points. One big factor in this team’s success early on through round 1 and 2 was the ability to earn a lot of pins which then gives a team bonus points (+2 points). Missing 4 different weight classes for this event, the Fauquier wrestlers seemed to work even harder and stepped up to earn those pins to offset with the team’s unbalanced line-up. Round three: The Falcons continued their winning streak into the quarters by winning 7 of the 9 matches. By winning in the quarters and advancing to the semi-finals this is where higher points are earned and wrestlers will automatically place in top sixth of the 32 man bracket. But sixth place is never on the minds of the Falcon wrestlers as they strive to simply win each match one at a time to be on the top of the podium. At day’s end on Friday Fauquier was able to advance 7 wrestlers to the semi-finals and keep them in first place with 116 points as they never looked back from that point on. Semi-Finals: As the Fauquier wrestling team took the mats on Saturday morning, for day two of the NOVA Classic their mission was simple; continue to push as many of the 7 wrestlers that were on deck and in the champion bracket to the finals. Matt Raines, Bennett Payne, Tyler Budd, Landon Dean, and Seth Baker all wrestled solid matches in their semi-final matches to qualify for the finals that evening. With two Tech Falls and one pin among this semi-final group, these wins insured that the Falcons would keep the lead for good as they pushed the point total to 186 points. Consolation Semi-Finals: To be at the top of the leader board of a 32 team tournament on the final day, you need all of your wrestlers to earn team points. As the 5th and 6th consolation rounds concluded and finished up, the Falcons had positioned three wrestlers that had battled back from a loss to get into the consolation semi-finals for the 3rd place match. Marco Tcheukado, Michael Villalobos, and Even Oddenino all had only one loss in the tournament but wrestled back and won respectably. Marco Tcheukado and Even Oddenino both ended up in 3rd place while Michael Villalobos took a 4th. With these wins at the end of the consolation semi-final round Fauquier improved on its score to 205 points. The Finals: Moving onto the Final round Fauquier continued to not let up as the team rolled with some great performances from freshman Matt Raines, senior Tyler Budd, and Junior Seth Baker who all finished first and won the NOVA classic in their respective weight classes. Tyler Budd was one of the outstanding wrestlers for team Falcons this weekend as he earned 5 pins with his final win over Willey Inserra from North Stafford in the finals. As a four year starter Tyler’s skill level on the mat has improved each year and now is one of the elite wrestlers in the state. 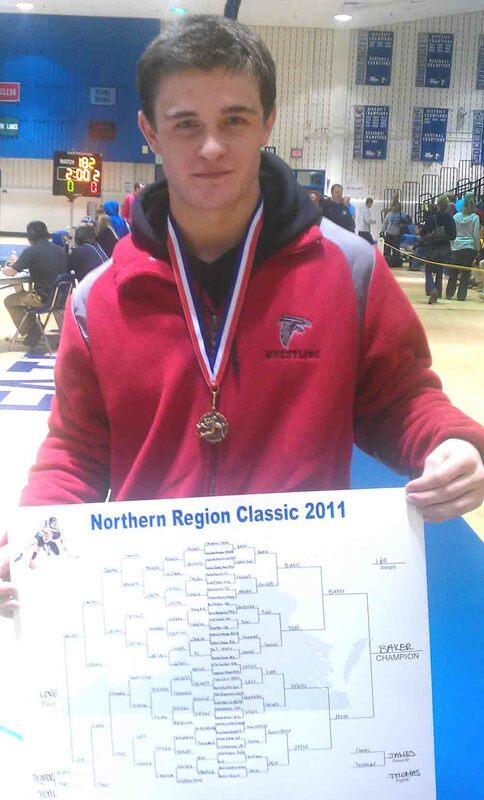 Pinning his way through this tournament does not come easy for anyone and to dominate his weight class shows Northern Virginia that he is the best 138 pounder in the area. Matt Raines has also started off the season very well with his 2nd place finish last week at the Skyline opener and now winning the NOVA classic in his first two meets as a high school wrestler. Matt won a 4-0 match over James Cusack-Marshall. Two weeks of outstanding performance should alert his team mates that even though he is a freshman he is in gear to battle for victory every time he steps on the wrestling mat. Having Matt in the starting line-up as a ready wrestler truly helps the team in this new season; his youth years of wrestling experience shows. Seth Baker also dominated his final match with a 5-3 win over Brett Stein from South County. Not in the line-up last week at the Skyline Elite opener put him in a position to start his season off this weekend with a bang at the NOVA Classic. Having few wins thus far compared to his teammates, Seth looks to add to the team’s winning ways as one of the leaders on the team. 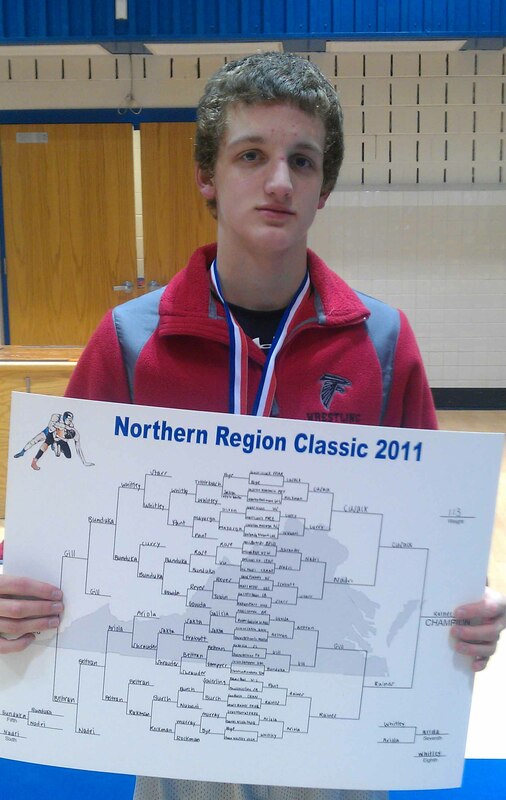 Seth can currently say that he is the sole Fauquier wrestler on the team with an undefeated record at 5-0. Coming to this tournament for the second straight year and taking second place in it last year,.... How does it feel to coach the Falcons to a team victory? Coach Fisher: It feels great. Many of the guys have been working year around, and it showed this weekend. We have also been tweeking some of our competition prep routines and what we are doing between rounds. Those adjustments also contributed significantly to our match consistency. We saw this team improve in the area of pins last year but once again the kids are producing a ton of them so far, any comment? Coach Fisher: We have been working on our ground game a lot in practice. It translated well. 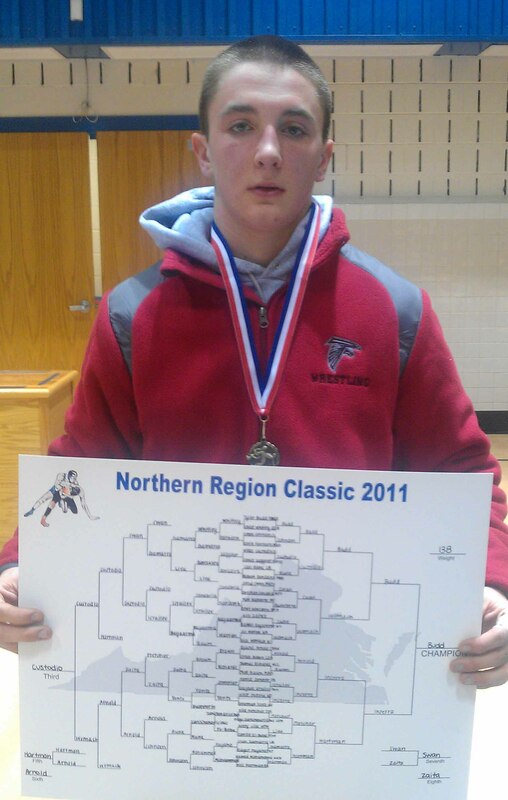 Tyler Budd had a wonderful tournament and really looks like a different wrestler from last year to this year. What has he improved on that has made him a pinner? Coach Fisher: One word. Confidence. He has more experience than anyone he will wrestle. He has been in the big matches. He now is ready to prove it. We also adjusted his pre-match routine which has helped is match mindset. Coach Fisher: A huge contributor to our early success is consistency. We no longer have seem to have “bad rounds” which are rounds where the guys come out flat. We have made some changes to address this issue, and so far our adjustments seem to be working. Below are the individual results from the Nova Classic.